Cigarette giant Philip Morris has said it cannot pay a $12bn (£7.6bn) bond demanded by a court as part of a smokers' lawsuit. The statement has led one credit agency to warn that the firm could be forced to file for bankruptcy. Shares in Altria, Philip Morris's parent, fell 7% in late trading on Monday, as investors worried about the mounting burden of litigation from smokers. Philip Morris aims to appeal against a recent judgement, which ordered it to pay $10.1bn for misleading smokers into thinking its "light" cigarettes were less harmful than regular brands. As part of the appeal process, the firm is obliged to post a $12bn bond, as an assurance of its willingness to meet any financial obligations arising from the case. 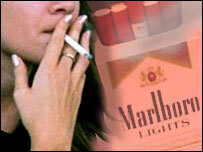 Philip Morris insists, however, that it is neither willing nor able to post the bond. "We have told the judge and we have told the courts that this is a practical and financial impossibility," said Bill Ohlemeyer, Philip Morris' general council. "This is all about putting pressure on the company to settle the case." In practical terms, this means that Philip Morris may be unable to afford an imminent payment of $2.6bn, part of a $206bn settlement between tobacco firms and US states, agreed in 1998. The failure to make these and other payments could trigger bankruptcy, credit-rating agency Standard & Poor's warned. Some states have already said that they will insist on prompt payment of the $2.6bn, since their own frail budgets mean they cannot afford to wait. Philip Morris insisted that bankruptcy was only a theoretical option. Even if the cigarette firm did seek protection from its creditors, it is unlikely that Altria as a whole would be dragged down with it. In addition to its tobacco business, Altria is the parent of food giant Kraft, owner of brands such as Philadelphia cheese and Milka chocolate. But Philip Morris is being buried under a growing mountain of litigation. In addition to the light cigarettes case, known as the Miles case after its initial plaintiff, it is being sued by a long-time smoker who claims he was deceived by cigarette marketing, by the state of Florida, and by the US Justice Department. So far, it has proved adept at fending off the most punitive financial damages. In the Florida case, the first class-action lawsuit against a tobacco company, damages of $145bn were awarded against the firm in 2000, but no final payment or judgement has yet been reached.